This Tissot Le Locle is a sophisticated timepiece for him, powered by automatic movement and offering a power reserve of 38 hours. Featuring a slim, round stainless steel case teamed with a luxurious link style bracelet, the watch is finished with a simple white dial complete with date window and traditional Roman numerals. Classic Swiss timekeeping. 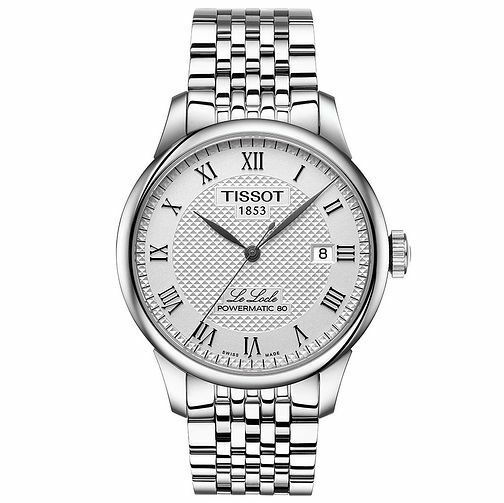 Tissot Le Locle Men's Stainless Steel Bracelet Watch is rated 5.0 out of 5 by 1. Rated 5 out of 5 by Anonymous from Amazing accuracy from a mechanical watch I liked Tissot and have had a quartz watch for over 30 years, but I wanted something with a soul and craftsmanship. Having some sentimental attachment to Tissot I was reviewing automatic watches when I came across this Le Locle and really liked the style of it. When I first started to wear it I was pleasantly surprised that it was only 5 seconds fast per day. Now after 3 weeks of wearing the watch it is less than 2 seconds fast per day. I am very impressed with the watch, accuracy , the open ornate back which allows a window view of the mechanism, the strap with unique clasp and all in all I am very happy. Further I learn the following... this mechanism was considered in 2012, Tissot's Le Locle Chronometre was pronounced by the Concours International de Chronometrie to be the most accurate mechanical watch of the year.